The JAY Care Wheelchair Cushion is a simple solution for comfortable sacral sitting when using sling style wheelchair upholstery. It can also be used on a solid adjustable seat in a dropped position. It's designed primarily for geriatric and stroke patients but is also helpful for individuals with Multiple Sclerosis, Muscular Dystrophy or Polio. 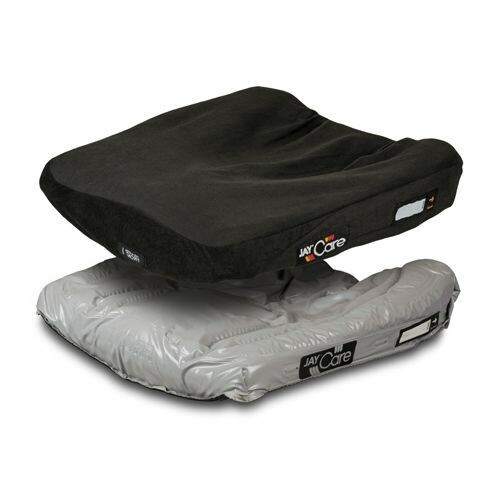 The Care Cushion provides a fixed posterior pelvic tilt with a reinforced curved cushion to maintain a level surface helpful in preventing a "hammocking" effect. 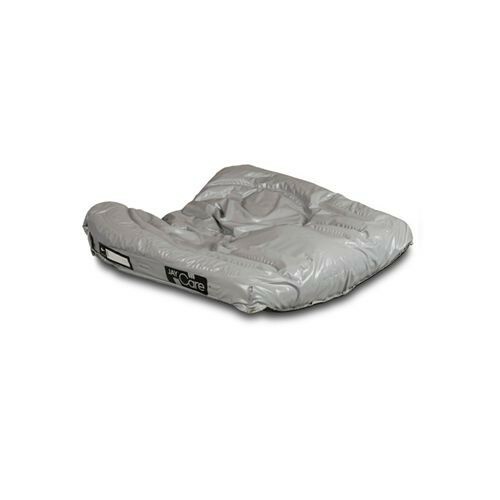 The foam within the wheelchair cushion has a water-resistant casing with small ventilation holes in the rear of the cushion to prevent heat build-up. The pre-contoured foam also has the JAY Flow fluid pad which uniquely contours to each body. This provides comfort by cradling the sacrum relieving key pressure points and protecting bony prominences to reduce the occurrence of skin breakdown and pressure sores. The Jay Care Cushion offers easy maintenance. Simply remove stretch cover from the fluid cushion, wipe cushion with warm water or alcohol swabs and toss cover into the wash. Two covers come standard with the purchase of the cushion so you always have a soft cover in place when the other one is being laundered.